As was evident with the previous lunar year's zodiac symbol, the Chinese character 羊 (yáng) can refer to sheep, goats, rams, and other related animals. Professor of Chinese Language and Literature Victor Mair uses the term "ovicaprid" when translating instances of 羊 (yáng) which are ambiguous. "Caprinae" may work as well. My earlier idea to go with "Year of the Yang" never took off. Although adding a preceding Chinese character provides more clarity, it is still common in China to see 羊 (yáng) without one. 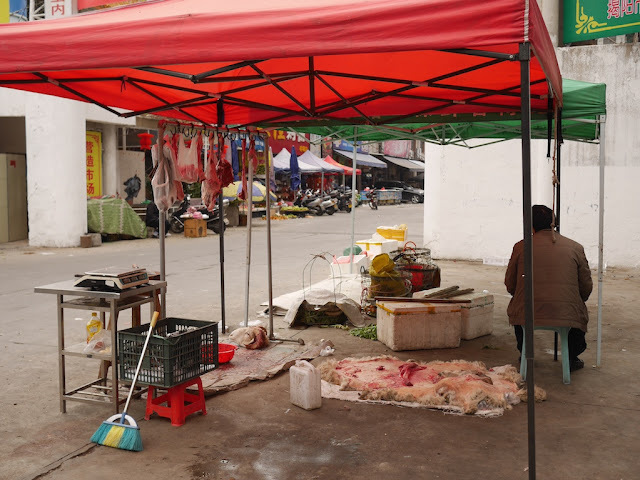 For example, a man I recently saw selling goat milk in Chaozhou evidently felt that no additional character was needed. 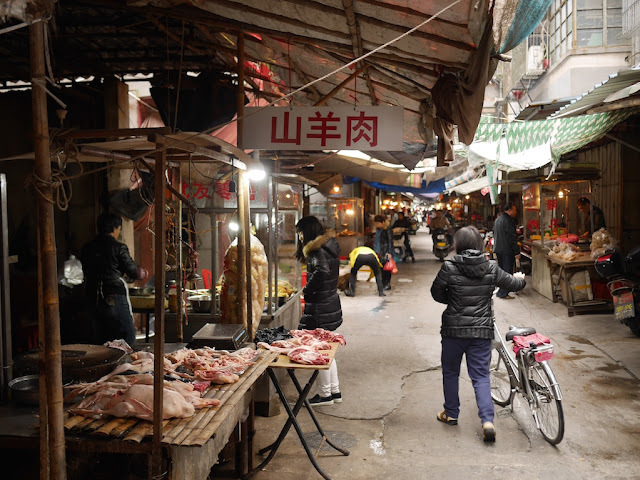 But at a market in Jieyang I passed through the other day, I saw several instances of 山羊 (shānyáng), which typically refers to goats. They weren't selling milk like the vendors with goats on tricycle carts I saw nearby. The third character in these signs means "meat". 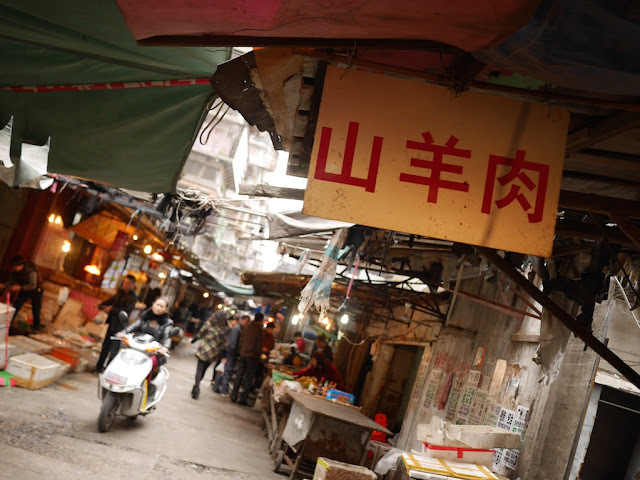 Elsewhere in Jieyang, I saw a restaurant sign which used 羊 (yáng) alone, once again with the meat character following. 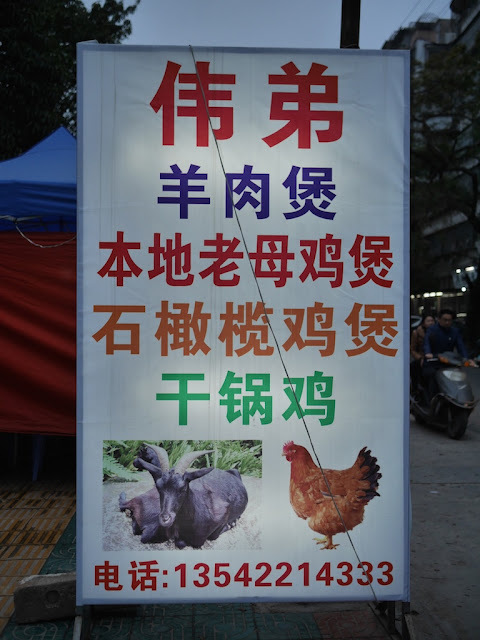 During my earlier days in China I would have assumed this meant sheep meat was on the menu. Given how I have seen the character used elsewhere in this region, though, I wasn't shocked to see a picture of a goat below. So what do they write in Jieyang when referring to sheep? I haven't explored this fascinating issue, but I did see one man selling sheep meat who didn't write anything at all. The head and skin did seem to communicate enough on their own though.